Tonight, our attention turns back to the FA Cup (with Budweiser!) and the magic BT Sport has given us a Friday night fixture. People have complained about football on a Friday being some sort of sacrilege, but Anfield '89 was a Friday. So, yeah. So, get out your yellow ribbons and your magic hats 'cause we're the famous Arsenal and we're going to Wemberley, henceforth spelled correctly. Nicklas Bendtner has been back in training since Monday and is "available if selected." Alex Oxlade-Chamberlain may or may not be handed a start; he played 62 minutes for the Under-21 squad on Monday, in their 4-2 loss to Liverpool. Carl Jenkinson played 90 in that match, as did fringe first-teamers Emmanuel Frimpong and Gedion Zelalem. If the latter is going to get his first Arsenal start this season, it'll come in this one. Kieran Gibbs might get a start; he hasn't started since the Newcastle match. As for everything else, it's Wenger's judgment call, so I'm not about to try to predict it. Wantaway Leon Clarke something something Wolves. The Sky Blues are led up top by Leon Clarke, who has scored 18 goals across all competitions this season. There have also been reports that he's handed in a transfer request to join Wolves. While Clarke is expected to start tonight, fellow forward Callum Wilson, who has 15 goals this season, remains out with a dislocated shoulder. In Wilson's absence, Belgian Franck Moussa has been starting alongside Clarke up top; Moussa has 12 goals on the year and has scored in four of his last six matches. 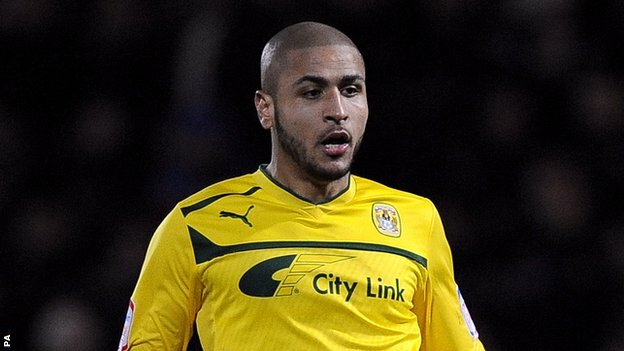 Moussa and Clarke each scored in Coventry's third round 2-1 win over Barnsley. 22-year-old John Fleck starts at the crux of the midfield and will be in charge of getting the ball forward to the strikers. New manager Steven Pressley has paid strict attention to fitness, as he has the Sky Blues playing a pressing style. Coventry will likely try to crowd the ball in midfield, rather than park the bus at the back. Arsenal have righted the ship, winning six on the bounce since going four winless in December. You know this, I know this, so let's talk about Coventry, since you might not have any idea what their season has been like. First of all, they're not even playing in Coventry anymore. With the club in administration and after a long dispute with Ricoh Arena over rent and matchday revenue, the club moved all staff out of the stadium. Currently, the club are playing their home games at Sixfields Stadium, the home of Northampton Town, which is 35 miles from Coventry; it's a tactic of playing hardball from the club's owner against the Coventry City Council, who own Ricoh Arena, who have arguably been screwing the club financially for years. Even fans debate who is really to blame in this quagmire. As for on the pitch, Coventry began the year with a 10 point deduction for being in administration. Despite the deduction, they are currently in 11th place in League One, just 10 points shy of the final playoff spot. They are unbeaten in their last five leagues game and have lost one of their last 11 across all competitions. They crashed out of their other two domestic cups, the League Cup and the League Trophy, after one round, both to League One leader Leyton Orient. They beat League Two's AFC Wimbledon and Hartlepool United, the latter in a replay, to get to the third round, where they beat Championship cellar dwelling Barnsley to reach this cup tie. handsome.... what were we talking about? Arsenal and Coventry met last season in the third round of the League Cup at the Emirates; Arsenal led just 1-0 at halftime through Olivier Giroud's first goal with the club, though the handsome French bloke also missed a penalty. The Gunners went on to win 6-1, with two goals from Theo Walcott and others from Alex Oxlade-Chamberlain, Andrei Arshavin, and Ignasi Miquel. Callum Ball had Coventry's goal. Prior to last year's League Cup tie, Arsenal had not played Coventry City since the Sky Blues' last season in the top flight: 2000/01. In that season, Arsenal won 2-1 at Highbury and won 1-0 in Coventry. Coventry's last win against Arsenal was on December 26, 1999, a Boxing Day fixture (obviously.) It is worth mentioning that that remains the last time the Gunners were beaten on Boxing Day. This remains true, even though I copied and pasted that from the preview I wrote last September. Coventry's last win at Arsenal was in 1993; Arsenal are unbeaten in their last nine home meetings with the Sky Blues. Arsenal have met Coventry twice in the FA Cup and advanced on both occasions. Both previous meetings also came in the fourth round, oddly enough. In January of 1975, Coventry and Arsenal played a 1-1 draw in Coventry; Arsenal won the replay at Highbury four days later, 3-0. In 1977, Arsenal won 3-1 at Highbury. The referee is West Yorkshire-based Robert Madley. This is Madley's first season in the Select Group of match officials and this will be Madley's second career Arsenal match, both cup ties. Arsenal saw Madley in October for their penalty shootout win over West Bromwich Albion in the League Cup. This will also be Madley's second Coventry match of the season; he took charge of their 4-4 draw with Preston North End on August 25. Last year, Madley was in the middle for Coventry's 3-2 win over Preston in the Johnstone's Paint Trophy Northern area semi-final; Coventry went on to lose to eventual champion Crewe Alexandra in the Northern final. Madley also worked Coventry's 1-1 draw with Milton Keynes Dons earlier in the year last year and a 2-2 draw at Cardiff in the Championship on March 21, 2012.